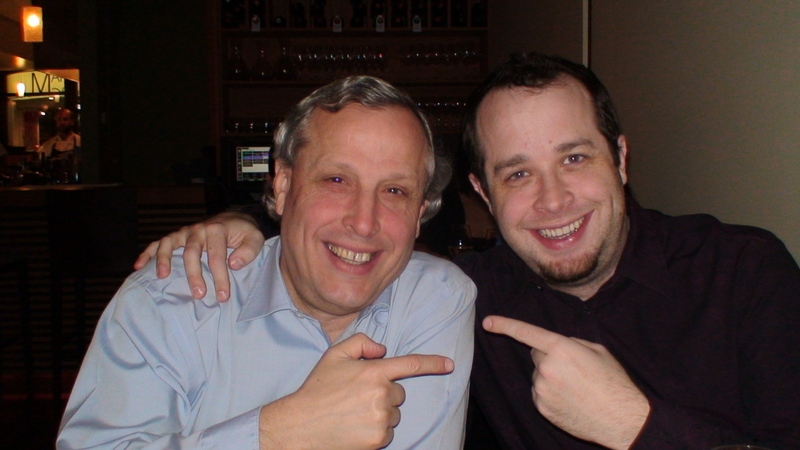 I was looking forward to this all week – dinner at Fuel with Carl, Marty G. and Marty G. senior (a.k.a. John). 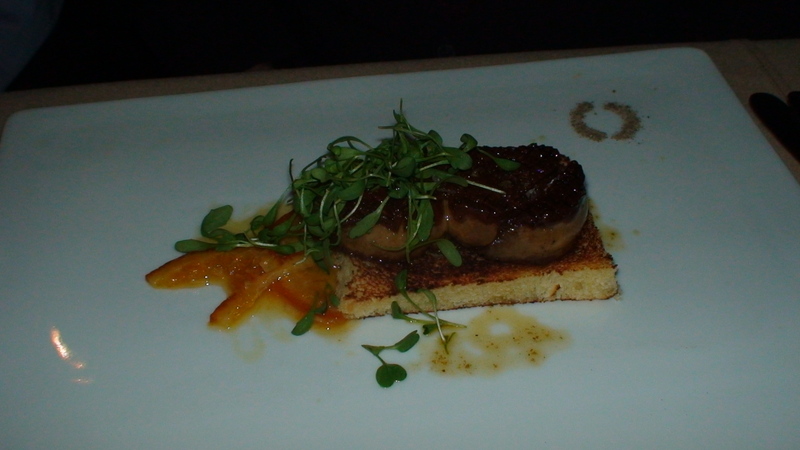 We enjoyed the chef’s six course dinner, a fantastic meal with some truly stand-out dishes. 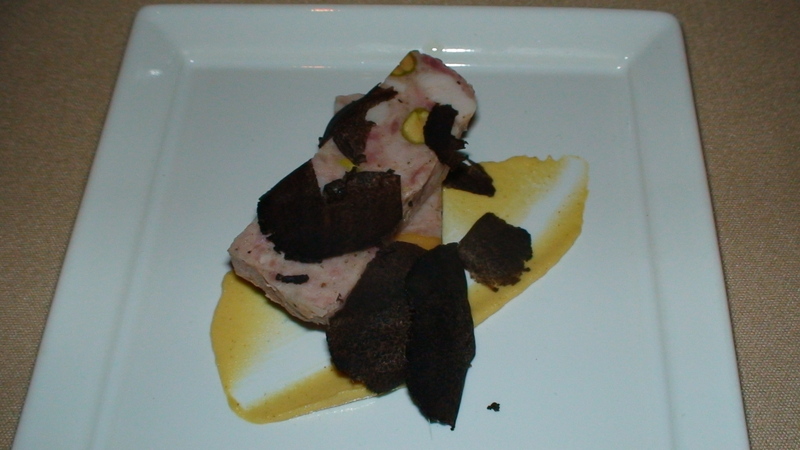 Half the table started with an hearty pork terrine with shaved truffles while the other half had the roasted beet and pig’s ear salad with perigod truffle vinaigrette. I offered my neighbor Carl half of my terrine in exchange for half of his salad. Carl, to no one’s surprise, elected to show great generosity by giving me the entire portion. 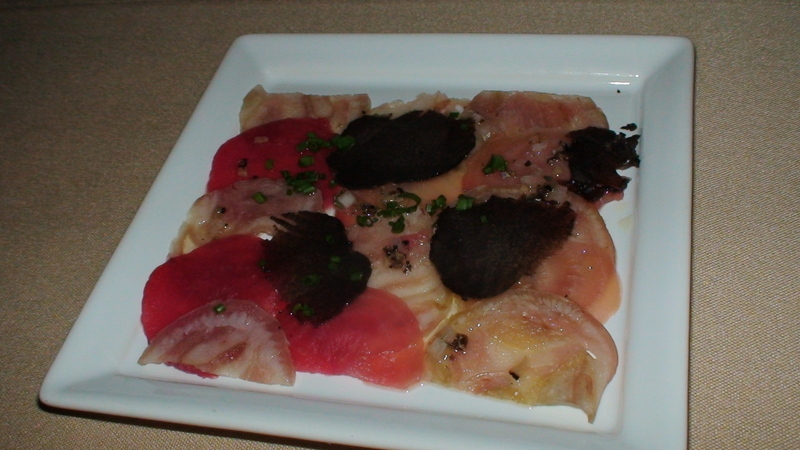 Well, while the thought of eating pig’s ear may have made Carl leery, I had no such qualms and greatly enjoyed the texture and taste of the thinly sliced pork and beet accompaniment. One of my favorite dishes of the evening – among many. Next up – the soups. 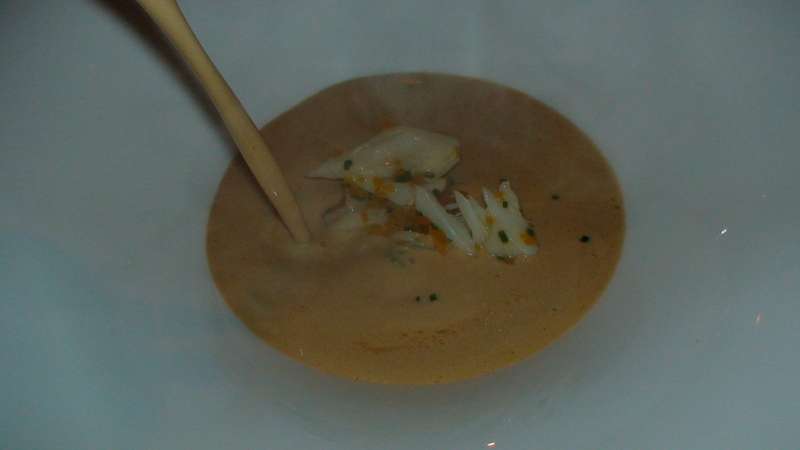 A Polderside Duck consommé for half the table, and an out-of-this-world crab bisque for the other. I’ve had the consommé before and enjoyed it, but the bisque was unbeatable. Carl kept stealing spoonfuls from my serving whenever I let my guard down. On his fourth attempt, I actually caught him with a stinging rap of my spoon against his third knuckle. That kept him on his side of the table – for a while anyway. 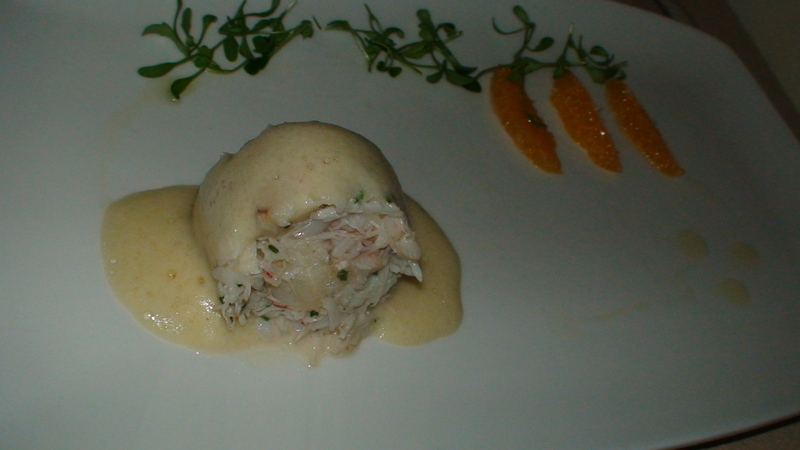 We followed with the seafood course – an ahi tuna dish for half the table, the chilled Dungeness crab with tangerine, red chili, and peppercress for the other. The tuna was very good but, this time, Carl’s dish got the nod and it was my turn to pinch a couple of forkfuls from his plate (“Hey, Carl, is that guy out there keying your car? You’d better go check to make sure.”). Next up was the foie gras course for all except Carl. Martin had the torchon, I had the foie gras and duck confit terrrine, while John had his foie just the way he enjoys it – pan-fried. 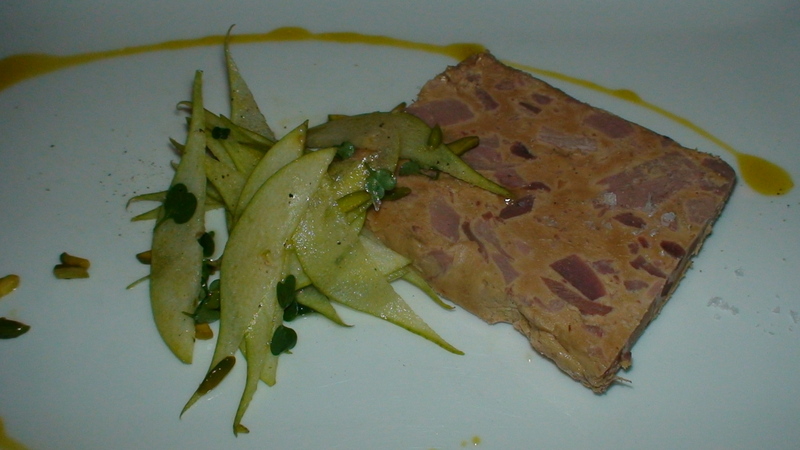 A bite of my wonderful melt-in-your-mouth terrine was wasted on Carl who almost gagged (Heathen!) 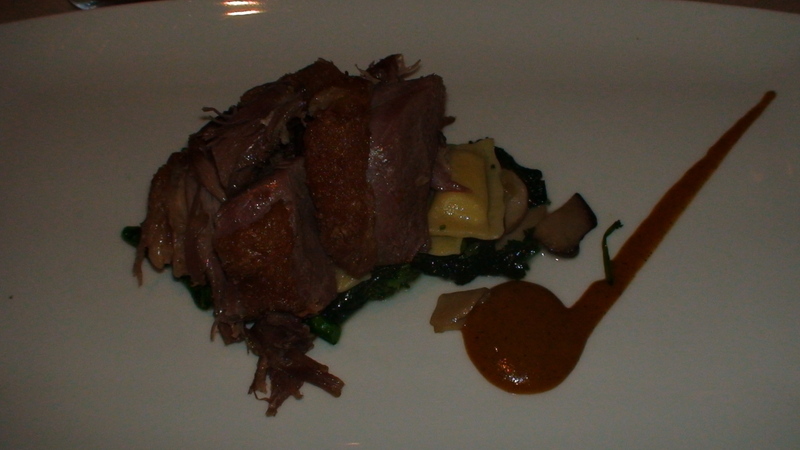 and redirected his attention to his Jeruselam Artichoke risotto (which he liked a lot) and house-smoked Polderside duck (that he adored). 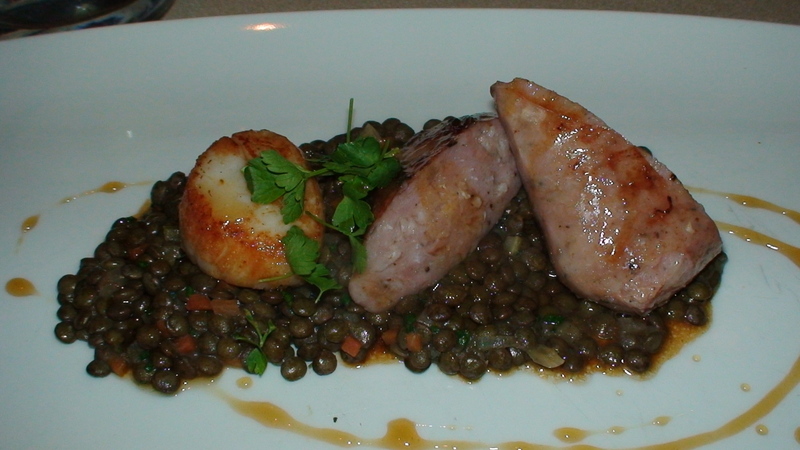 This was followed by what I at the time considered the dish of the night: truffled pork sausage and seared scallop served atop a bed of atypically tasty lentils. The sausage was nothing short of unbelievable. Carl, wide-eyed and too busy chewing, nodded emphatically in agreement. The sausage was going to be damn hard to beat. 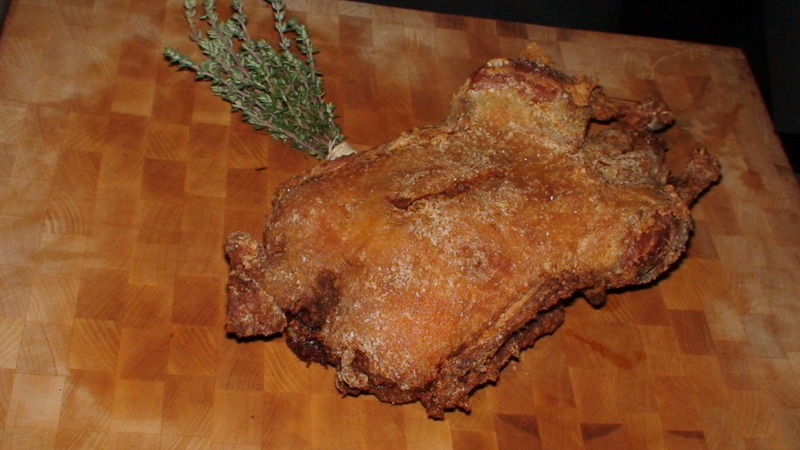 But Chef Belcham did it by bringing out the big gun: the whole deep-fried duck. Although I’d enjoyed this particular dish with mom, sis, and Fondy over the Christmas holidays (I believe I crowned it be best duck dish ever), it was a first time for everyone else. And, not surprisingly, they were all blown away. John, who’d declared himself stuffed prior to having the dish set down in front of him took one bite and informed us “It’ll take a while, but I’m finishing the whole thing.” And it did take a while. And he did. 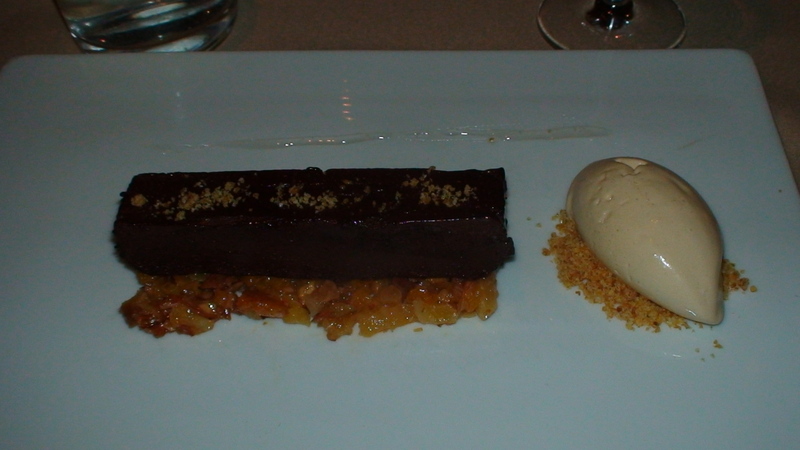 A mix-up in the four different desserts thankfully landed me the incredibly rich Manjari chocolate terrine. John had the fresh green apple tart, Martin the crispy ginger pudding, and Carl the roasted dulce de leche pound cake with pumpkin confit – but it was my terrine they were eyeing. All-around class act Marty G. used his magician training to pick up the bill without Carl or I even noticing. Just for that: no notes on his next script! Another episode aired, another line from the teaser poem revealed. The reference to Midway = “Two warriors head off an incursion on Earth.” Simple, no? Today’s entry is dedicated to LLB’s sister Barb. Answer: At present, yes it is. Answer: It was never scrapped, merely reconsidered at the idea stage. The actual entry/exit chamber was the big concern because building it would have pretty much crippled our budget. So we found a way to compromise, have the VFX crew work their magic in one of our standing sets (The SGC gate room) and play most of the action in the adjoining corridors. Answer: Trust me. We’ve made suggestions, special requests, bitched and complained. But, in the end, there’s not much we can do. It’s their network and their promos. Answer: Damnit! We ordered a baby, a placenta, two orders of fries, and an apple turnover, but received a baby, an umbilical cord, two orders of fries, and a raspberry pop tart instead. We’re looking into the mix-up. Answer: That was a network decision. Answer: Good eye. Yes, they were. Answer: Hey, Kyle, thanks for the very informative post. Re: MGM. I’m not sure (and not sure why the dvd’s have yet to be be released in either format) but will look into it this week. Answer: I don’t believe there are. Answer: Nothing on the former. Answer: Nope. As with most long jumper flights, they go right in the back, then have everyone either pile into the cockpit area and seal it off, or hold on tight at which point the ramp is lowered and rapid decompression takes place, effectively clearing out any unwanted material. It’s a bit of a pain, but very effective. Answer: Actually, we’re just going to use a lot of forced perspective like they did in LOTR and have Marty G. play the baby. He’s off getting his scalp waxed as we speak. Answer: Sorry, Jack. I had nothing to do with SG-1: The Alliance game and don’t know anything about the Haaken. Answer: I make it a point to walk around the production offices first, offering them to my co-workers. I will then wait half an hour and do the rounds again. If everyone seems okay, THEN I’ll try the chocolates myself. Answer: Yes, I was going to bring up Catwoman – and, frankly, Deadpool as well. Criminal pasts count. And a super villain does not necessarily have to be evil. Although it certainly helps. Answer: I’m not doing any nudging. I told Jason that the decision is his. Answer: Really? As far as babies go, I thought this one was about par for the course. Answer: I have always been a supporter of Gateworld and consider it the premiere site for Stargate fans online. In fact, I was the one who suggested to MGM Marketing several years back, that they look toward establishing some sort of working relationship with Darren and Gateworld. As I explained to Darren in a recent email – My comment in yesterday’s blog entry was not intended as a blast at Gateworld, but as an example of how fan expectations can be raised or unintentionally misguided by a misinterpretation of the source. Gateworld’s attributing of the non-existent quote was simply another link in a developing chain. While I could have contacted them about the article in question, at that point it was already too late. It had been published and my apparent words officially reinforced. The point of my commentary was not to critique Gateworld but to go on record now, before the episode airs, and make it clear that I had been misquoted. Asking for a quiet retraction would not have solved the problem. Answer: Interesting theory. Let’s see how that plays out the next time they cross paths with Todd. Next episode. Hey Joe, I-BAM! Oh, that was a good one. Anyway-POW! Yeah! Sorry, it’s just that I’m watching Monk and after all these years it’s finally got-BOOSH!-exciting for me. Monk pays off. Who would have thought it? I liked Midway. But when they went to Earth, where was Landry? Shouldn’t he have been there? I really enjoyed Midway. It was so nice to see Teal’c again, and I thought the Teal’c/Ronan dynamic was fantastic. I also noticed it was the Daedalus set but I figured that since it was the same people who built the Daedalus (And Odyssey, etc), the tech would look the same.. wouldn’t it? Okay, Midway rocked! I’m not sure I agree it’s the best episode of the season [Lifeline, BAMSR and maybe Adrift top it out] but none-the-less a great episode. Thanks and well done to all involved. Teyla’s return was much appreciated and her experience with Coolidge makes me wonder how Vala’s interview went. Loved the end scene with Shep and Ronon. The only nit I can really pick is with Kavanaugh. I was excited when I heard he’d be back but he, like so many scientists, ended up being comic relief. I’ve been wanting to go to a Stargate convention, but it has to be in the summer because of school. I’ve looked it up but can’t find anything. Do you know if there are any conventions during the summer. You made my mouth water with your descriptions of dinner Joe. Not that you don’t usually, but it sounded particularly delicious this time. What types of chocolate are you eating at the moment? HA! I was right about my “toilet theory”! But, realistically, what they could do is have everyone move to the front compartment while the person who needs to use the toilet(for number 2, as 1 would be easier – some bottles or something; they DID say they had water on board ), then he’d move to the front, seal the compartment, then vent the atmosphere in the back. Problem solved. is there any sam/jack ship in ‘continuum’? *SQUEEEEEEEEEE* *Cough* Um, I mean, if by “possible”, you mean “definitely”, thank you from the bottom of my McKay-whump lovin’ heart. @pm 5 ~ the San Diego Comicon and Dragon*Con both have very strong Stargate presences (or Dragon did last year, at any rate — we’ll see how things go for this year as it gets closer). Comicon is in July, Dragon is at the very end of August/beginning of September. Also, Creation has a Stargate con in Chicago in August (although, given mutterings I’ve heard, I would not really recommend that one — hell, it’s right around my brithday and it’s my hometown, and yet I currently have no interest in going). I actually guessed the answer to the no-facilities-in-a-jumper problem. I assumed the emergency supplies would include copious amounts of disposable bags, toilet paper, and baby-wipe type cleaning cloths. Even so, Ronon is a far braver person than I am, opening then going into a jumper filled with 6 men who hadn’t showered or changed clothes in several days. And how many days was it? Before the Asgard upgrades to the Daedalus, it took, I think, 18 days to get from Earth to Atlantis, making it logical to assume 9 days to get to Midway Station. With the Asgard upgrades, is it a quicker trip now? Technically Emma is still evil–she’s just evil with the X-Men rather than against them. Is the third SG series coming this year? I did wonder about that chocolate I sent, whether you would actually be able to try it. I hoped so. At any rate, it was kindly meant. Well, to be honest, I’m one of the few that didn’t really like Midway that well. I am hoping for an episode I will enjoy more next week. And wow, you really think Sci-Fi would have learned a thing or two about not spoiling episodes by now. But then, this is the network that airs Flash Gordon, so I do wonder about them sometimes. Ack, sorry for the second post but I was wondering: Re: Midway – Were those supposed to be noise-cancelling headphones Shep was wearing in the puddlejumper at the end. Those are some great pics of dinner. In reference to your chocolate party last year, the pictures were incredible. I can only imagine what you’re considering for this year’s spread. Do you have any particular inspiration for throwing chocolate parties? When it comes time to choose the food (or treats as the case may be), how do you decide what to present? One question, are you aware McKay and Teal’c have never actually met each other? In 48 hours Teal’c was stuck in the gate, in Redemption Teal’c was off world, in Moebius Teal’c wasn’t on the team, in Peg project Teal’c was in the Milky way. Road not taken Teal’c wasn’t there either. And same again in Midway they didn’t meet each other and no where they have in between. Is this something you are aware of for two major characters who have both crossed over into each others shows having not met each other? And yes, Gateworld is a popular site and posts a lot of news, but there are various factors why I don’t think they’re a good site, at all. They post spoilers as news without warning, they post items as news which they’ve posted before simply so they have news (see the recent Carson Beckett or Alicia Vega news stories), they act as if America is the only country to get the show (I.e. ruthlessly promoting the show when America gets it, but when other countries get it first they virtually ignore it), and their forums are honestly a mess, they usually have two-three threads on the same thing going at the same time. Gateworld is not a great site imo, and there are better. On sites I frequent they have quite a bad reputation, for reasons like this. I’ve seen news items they’ve posted saying certain things, then checked their source for them and the impression they give there is completely different. I didn’t take the comment against Gateworlds news item as bad as simply, it’s time someone said something. I know the producers have supported Gateworld, but they should take more time in checking what they post sometimes, and if a producer calls them on it, then too damn right if they were wrong in something. People shouldn’t complain if you honestly have seen something they have directly misquoted saying it’s the truth. First, I loved Midway…. Kudos to Carl!!! Second, I can’t wait for dinner at Fuel on April 3rd. With each description of your meals at Fuel, I get more and more excited. I don’t know if my taste buds can take any more anticipation. I moved to the Puget Sound area in April 2007, and I’m learning my way around the Great NW, but I still think of the times when I lived in Philadelphia and would partake of the many diverse restaurants in the Tri-State area. A large group of us from work use to go out to a different restaurant every other month or so and try everything we could on the menu! 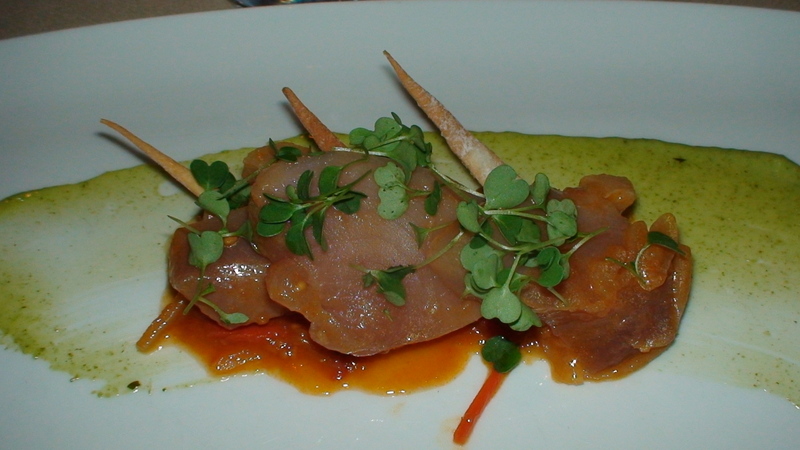 We’d all order a different menu item and then we pass the plates around, tasting and savoring the chef’s creations. It was a fun way to get together and share an evening of food, fun and interesting conversations. We called our group “The TASTEBUDS”, because we tasted as many new food items as possible and were we “Buddies” after all…. Hence Tastebuds!!! I miss my friends in Philly and I think that is one reason why I am looking forward to this meal at Fuel so much! I know you and Marty plan on being at both dinners in April and we are all so happy to hear that is confirmed. However, I want to ask a favor… would you and Marty please have a nice 8×10 photo taken of yourselves ‘together’ and have copies available to hand out and sign for us ‘personally’ that evening? I hope that this is not too much to ask for, because, lets face it, the Writers & Producers are the real heroes of SGA. IMHO! Thanks for listening! Hope you agree with my suggestion, because it would be wonderful to have such a nice memento of the evening. Thanks for everything! Including today’s pictures of the tasty dinner. Blessings Abound! Holy crap. I think I’ve died and gone to chocolate heaven. I don’t believe I started following your blog until later last year, so I didn’t get to see that post regarding your chocolate tasting event. OMG. While I recognized most of the brands, there was one that I did not recognize – what is the one that had samples of something in little white jars of some kind. What the heck is in those and what company produces those lovely looking chocolates?! I thought I read on the vellum insert something that started with a “D” but skimming your list, I didn’t see anything that looked unfamiliar to me. Help! BTW – this has to be the best season of SGA yet – every episode has been entertaining and wonderful to watch. LOVE it! Kudos to all! I just have to ask this, that food look amazing, but judging by the prices at Fuel, how much did your meal cost with all those dishes?! I really wish I could attend the Fuel dinner (would love to meet you in person. ), but not living in the Vancouver-area prevents that. 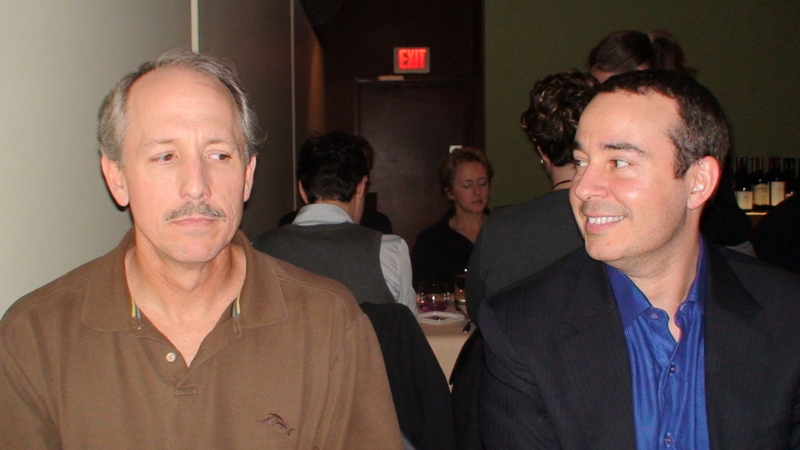 Nonetheless, I thank you for giving fans like me the opportunity to enjoy a nice dinner with you and Marty. PS – Loved “Midway”, indeed! It looked like Jason Momoa got smacked in the eye in that last scene of Midway on the jumper(and earlier scenes with the fight between Ronon and Teal’c). Was that a real black eye or just makeup? will there be any sam/jack ship in s5 of atlantis? Another yummy looking dinner. AND free. I want Joe M & the other writers to know that while I came to it as a fan of SG1, I love Stargate Atlantis & its characters all for itself- I don’t NEED SG1 characters to make it a better show for me. I just think its great when it happens because its cool to see long established (fave) characters continue within the Stargate universe and interact with newer (fave) characters, currently based in Atlantis. What makes a great TV episode- for me- is a good story coupled with good character portrayal. Saw Midway, loved it to pieces. 1. Where was the initial scenes with the Wraith filmed? You know, the badland-ish place? It’s beautiful. 2. The Wraith leader in this episode; shouldn’t he be dead? I mean, he was in that cloning facility when that hive ship crashed into it in Spoils of War, no?